Our approach to pupil wellbeing rests on the firm belief that girls achieve their best when they feel happy, supported, respected and valued. Reflecting our focus on the whole person, we make sure that academic and pastoral supervision are equally prominent. 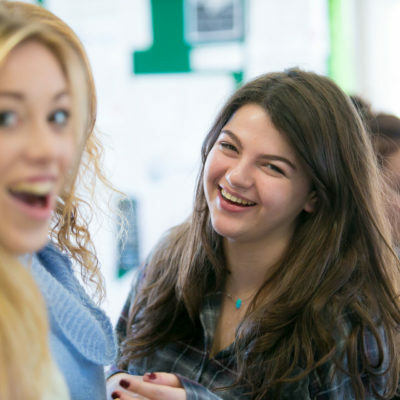 The Sixth Form common rooms are full of life and energy, with kitchen facilities in the Year 13, Year 12 and common rooms. We run two dedicated Wellness Weeks each year and social opportunities are abundant with favourites featuring Movie Nights with The John Lyon School, the Halloween Carnival and the Year 13 Panto. Exciting and inspirational trips range from a visit to Iceland for Geography students to Washington; an afternoon of bowling to the six week World Challenge in Borneo. Sixth Form students have a great deal of freedom and independence, but will need support and guidance. Sixth Form teachers work with small groups of girls from both Years 12 and 13 in daily registration periods, kick-starting the working day with wisdom and energy. Year 12 students gain the benefit of spending time with older students, who can advise and encourage and Year 13 girls enjoy mentoring their younger peers. Because we care deeply about our students as rounded individuals, all students in Years 12 and 13 enjoy a dedicated period of Enrich and Extend each week, in which they receive guidance about personal, social and health matters. Students learn study skills, develop confidence in public speaking, hear from inspirational women in a variety of careers, are taught basic financial skills and self-defence and hear about nutrition and mind and body relaxation. We believe that every day in the Sixth Form should be an adventure and provide the platform and tools to explore and develop existing talents and interests – and to discover and nurture new ones. Over 70 extra-curricular clubs run each week across school and our Sixth Formers partake in many in the fields of dance, drama, music, art and sport, ranging from Model UN to Trampolining and Climbing to Creative Writing Club. We look after the whole person in school life, helping girls stay healthy in body, mind and spirit. This means we celebrate success in all its forms and encourage our girls to strive to be better but also support them through life’s inevitable setbacks or failures. Our approach helps girls develop a strong sense of self-esteem and responsibility towards themselves and others and the wider world around them. It is part of the moral compass we want them to have.